i’ve just bought flowheater designer + batch, but i have a problem with the excel adapter (read side). i am using windows xp (italian language) with office 2007 (english language). please, can you give me your feedback about? 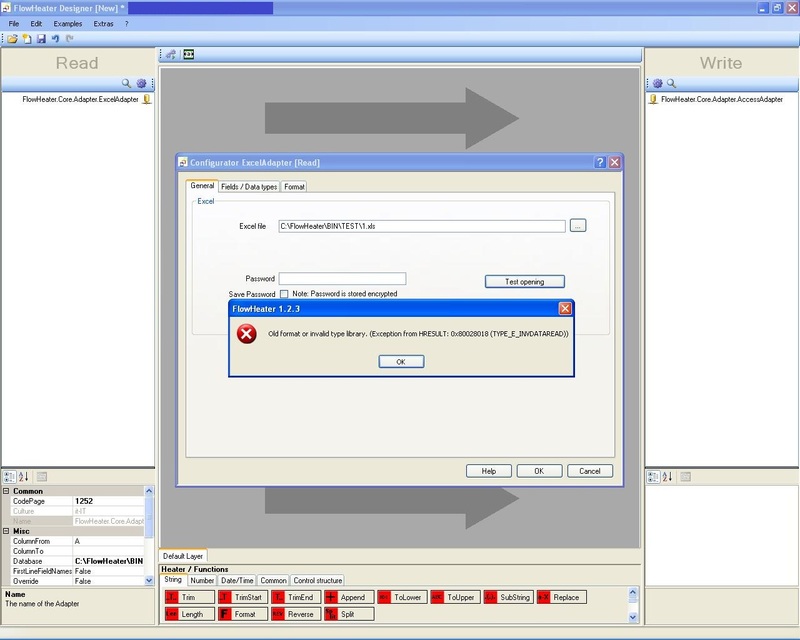 Can you open your excel file via MS Excel 2007 without any errors or warning messages? How have you created the Excel file that you want to export? Perhaps with a previous FlowHeater definition? In this case the errors occur from this. By now FlowHeater can only create the default Excel file supported by the Excel version you have installed on your machine. To fix this you have only to use the .xlsx extension for the file name in the excel configurator . If the error still exists we need a bit more information. Please try the example in the attachment. The example just exports an .xslx Excel workbook 2007 file to a csv text file . If this example runs on your machine please post your Excel workbook file for further analysis. unluckily also the test file attached can't be read by flowheater. 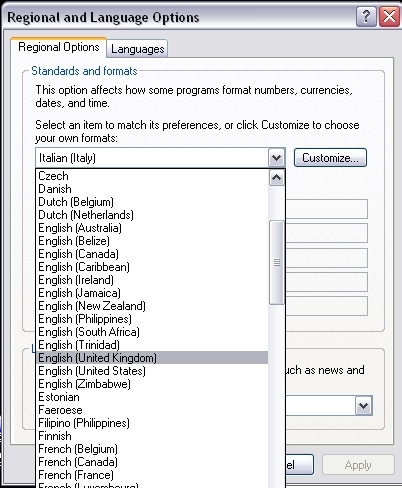 anyway, i succesfully managed to read the file after changing the "standard and format" option, under control panel-->regional and language option, from italian to english uk. basically, my version of excel is in english language, and so, i've had to change the regional and language option of the pc to english, in order to make flowheater able to read the excel file (in other words, the "language" selected under the regional and language option must be the same of the excel version installed). obviously, this is a workaround 'cause i'd like to use my preferred language option, instead of changing it. Thanks for the information, this helps us a lot. You can download a workaround (BETA) version of FlowHeater here . In this version we switch the current culture to en-GB. NOTE: If you create new FlowHeater definitions with this version, the number and date/time format is set by default to this culture. You must switch manually the format settings to it-IT in the adapter format settings if you want to use Italy format for number and date/time. E.g. for CSV input or output. You can use both versions at the same time. You just have to use this BETA Version only for Excel imports/exports. In the next release version (1.2.4) we fix this issue. Hope you can work with this little workaround for the next few days?